ARCATA -- After leading Arcata Police on a brief chase through an Arcata neighborhood, Igor McGregor of Arcata, 18, flipped his car and struck a utilitypole, causing a power outage. Police encountered McGregor driving at a high rate of speed on K Street Saturday around 7:45 p.m.. When police pursued, McGregor accelerated and turned into a residential area adjacent to the downtown area. McGregor struck several parked cars before hitting a curb and flipping his vehicle near K and 13th Streets, where it came to rest against a tree and a utility pole support-wire. Most utility poles in Arcata serve power to at least a half-dozen nearby homes, and oftentimes a single pole can affect service to many more homes in the area. Given that, at minimum, 1 out of every 10 homes in Arcata is used primarily for indoor marijuana cultivation, this violent ending to a high speed car chase in town likely cut power to at least one big grow operation. 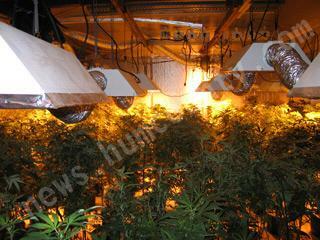 No affected indoor growers in the area could be reached for comments after the accident, making it hard to estimate the full extent of damage caused by McGregor's drunken car chase.